Tulum’s greatest attraction is its location itself as it stands on a bluff facing the rising sun looking out on views of the Caribbean that are nothing less than spectacular scenery. Ruins are situated on 12-meter (39 ft) tall cliffs, along the east coast of the Yucatán Peninsula on the Caribbean Sea in the state of Quintana Roo, Mexico. The Yucatan Peninsula on Mexico’s southeastern coast is famous for its fabulous beaches, Mayan archeological sites, and the Great Mayan Reef. Many visitors come for the sun and nightlife and spend their time in one of the luxurious hotels along the Cancun strip. There’s more to the Yucatan than Cancun and it’s easy to rent a car or hop on a local bus and see it all. The Yucatan has 500 species of birds. It’s a great place for snorkeling and diving because the second largest coral reef system in the world runs by it. Tulum is said as one of the last cities inhabited and built by the Mayans, it was at its height between the 13th and 15th centuries and managed to survive about 70 years after the Spanish began occupying Mexico. 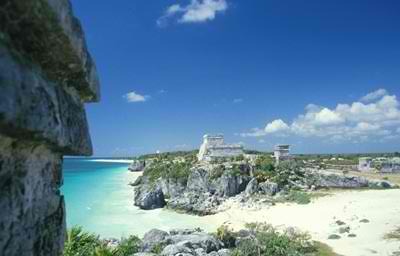 Now known as one of the best-preserved coastal Maya sites, Tulum is today a popular site for tourists. 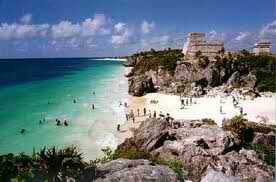 Tulum has architecture design typical of Maya sites on the east coast of the Yucatan Peninsula. This architecture is then recognized by a step running around the base of the building which sits on a low substructure similar to Chichen Itza. Doorways of this type are usually narrow with columns used as support if the building is big enough. As the walls flare out there are usually two sets of molding near the top. The most of the room contains one or two small windows with an altar at the back wall, roofed by either a beam-and-rubble ceiling or being vaulted. This type of architecture resembles what can be found in the nearby Chichen Itza, just on a much smaller scale. The name Tulum is the name given the site following a visit by the explorers Stephens and Catherwood in 1841, just before the beginning of the Caste War in 1847, long after the city was abandon and fell to ruins. They ordered trees cleared and Catherwood made illustrations of temples, later to be published in their famous book “Incidents of Travel in Yucatan”. Juan José Gálvez is actually credited with Tulum’s rediscovery in 1840.